A dusky evening in the Pasleys sets the scene as colors start fading to dark. If you are lucky enough to cruise west past Worlcombe Island look to the north and if the atmosphere is just right you will get a clear view straight up Howe Sound to Mt. Garibaldi. 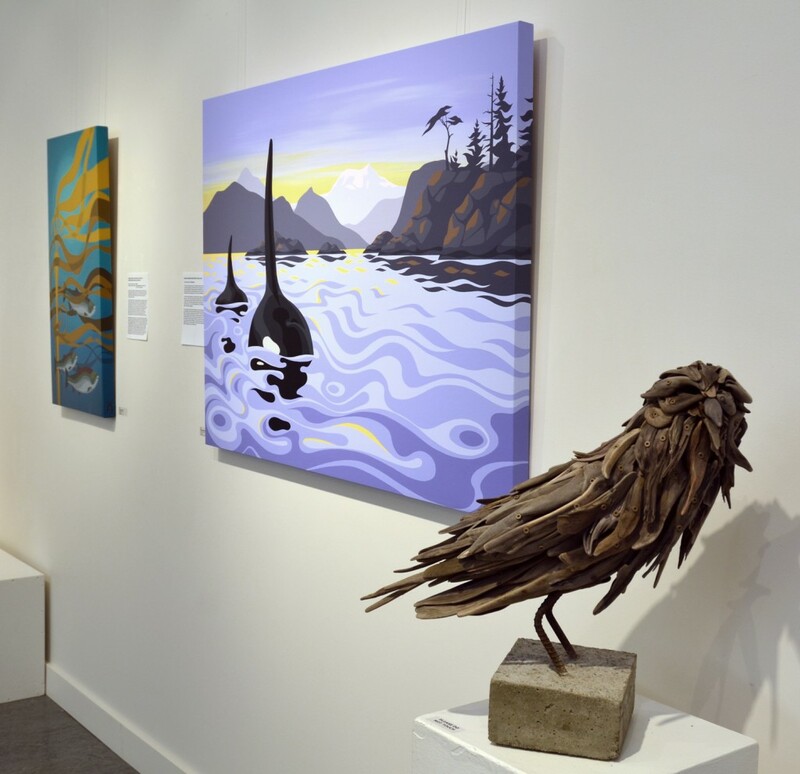 It is one of my favorite places in the Salish Sea and the one that inspired the location for this piece ‘Returning Home’. The calm evening waters ripple as orcas glide in. Increasingly seen after decades of heavy industry in Howe Sound their return is partly attributed to efforts made by the Squamish Streamkeepers to increase herring spawn, which attract the salmon, who bring the whales. The Orca is the largest member of the dolphin family and can be found in oceans throughout the world from the Arctic to the tropics. 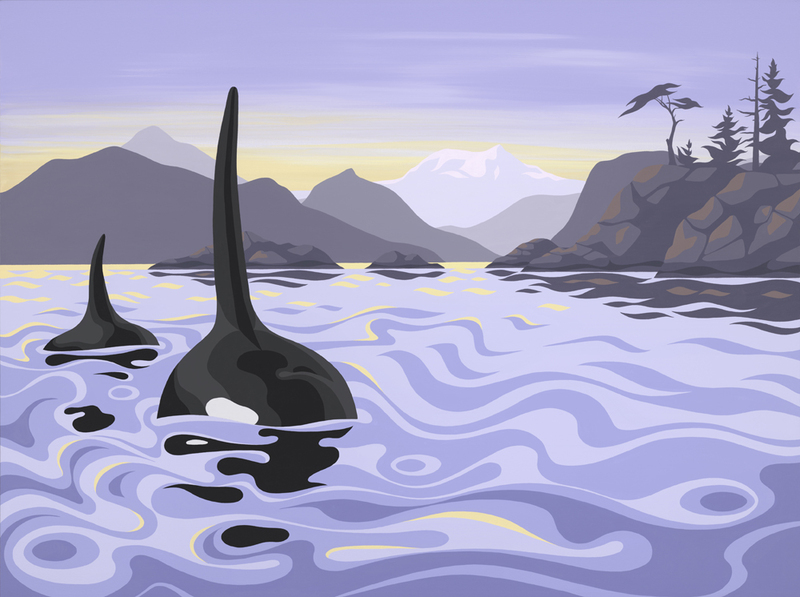 The Southern Resident Killer Whales represent the smallest of four resident communities within the Pacific Northwest and are the only Orca population listed as endangered by the US Fish and Wildlife service. 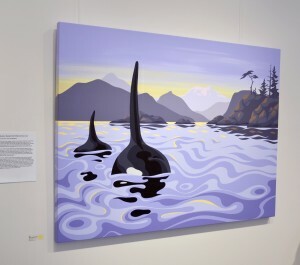 From April through September, the three Southern Resident pods, known as J, K and L pods, usually travel throughout the inland waters of Puget Sound, the Northwest Straits and Georgia Strait in British Columbia. This 300-mile long inland waterway is increasingly known as the Salish Sea. As of June 2018 there are only 75 individuals that make up this small population. The main threats to the Southern Resident pods include decreased prey availability, pollution and contaminants causing reproductive issues, and noise and crowding from vessel traffic. This specific group of orcas is distinct from other transient communities based on their diet of almost exclusively fish; 97% salmon (mostly Chinook) and 3% other fish. Depletion of large quantities of fish stock in marine environments has led to decreased prey availability. Aquaculture has also had a negative effect on world fish supplies in various ways including the spread of pathogens to the wild fish stock.